Reliable email functionality is an absolute necessity for any business today. Internal email services housed on your own servers used to be the gold standard for many enterprises, yet today’s cloud-based options offer far greater scalability and flexibility than server-based email. For many industries and businesses, security and compliance are vital to ensure trust and help follow strict regulations. Unfortunately, maintaining high-security standards and adhering to compliance regulations takes a lot of time and hinders productivity when managing it on your own. 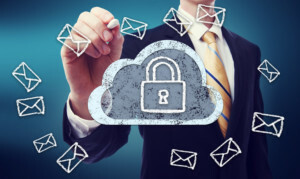 Effective, cloud- based, secure email solutions help organizations comply with global, regional and industry-specific requirements like healthcare (HIPAA), government and homeland security (FISMA), education (FERPA), and banking. And applications stay up-to-date with evolving privacy compliance standards. More and more businesses are coming to USA Voice & Data to fulfill this need and to avoid the costly and unnecessary expense of hiring someone full-time with that expertise. By carefully monitoring the cloud services marketplace for all our clients, we stay on top of the many different emerging cloud providers, their solutions and their most competitive pricing. Contact the cloud service experts at USA Voice & Data to find out more!